With the 2012 presidential election rapidly approaching, the oil lobby is pushing harder than ever to frame the Keystone XL Pipeline (KXL) as a "job creator." However, TransCanada (the Canadian company behind the pipeline), the American Petroleum Institute (API), and the U.S. Chamber of Commerce have used massively inflated statistics. In fact, KXL would create few permanent jobs. 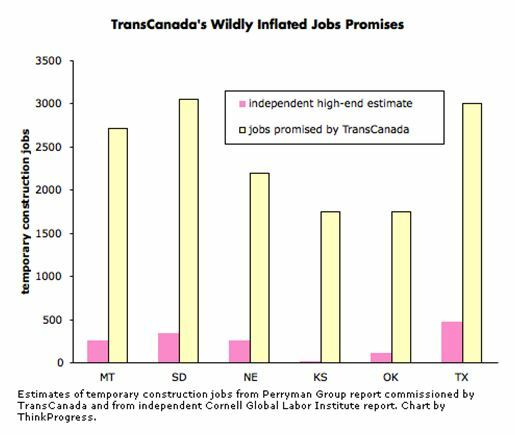 FACT 1: Experts Say Those Numbers Are "Meaningless" And "Dead Wrong"
TransCanada numbers count each job on a yearly basis. If the pipeline employs 10,000 people working for two years, that's 20,000 jobs by the company's count. FACT 4: Even TransCanada Acknowledges That Each Construction Job Will Only Last "One Year."